A circle is the set of the points which are in equal distance(radius) to a given point(centre). Calculate its diameter, circumference and area. 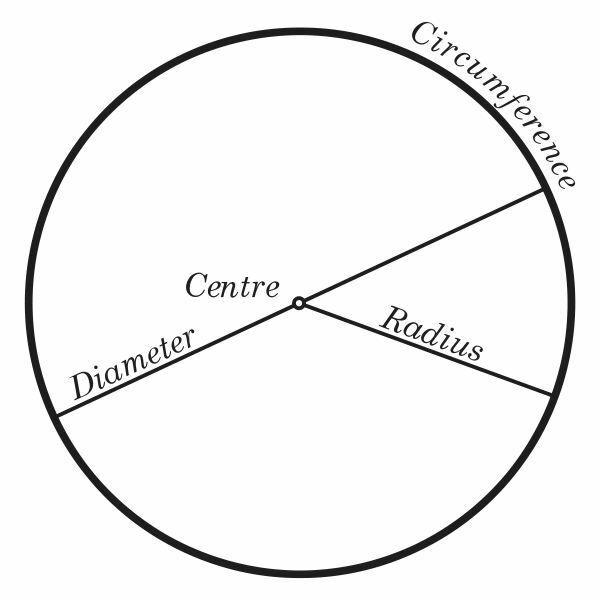 Circle, geometrical curve, one of the conic sections, consisting of the set of all points the same distance (the radius) from a given point (the centre). A line connecting any two points on a circle is called a chord, and a chord passing through the centre is called a diameter. The distance around a circle (the circumference) equals the length of a diameter multiplied by π (see pi). The area of a circle is the square of the radius multiplied by π. An arc consists of any part of a circle encompassed by an angle with its vertex at the centre (central angle). Its length is in the same proportion to the circumference as the central angle is to a full revolution.